Exciting news – the brand new Occasions Catalog starts tomorrow and Sale-abration begins too! Yay! 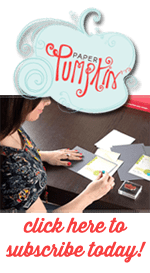 This is when Stampin Up gives you free goodies for every $50 increment you spend (pre-tax and shipping). Who doesn’t love free stuff? And since you were already going to pick up a few items, you might as well spend $50 so you can get your free item too! 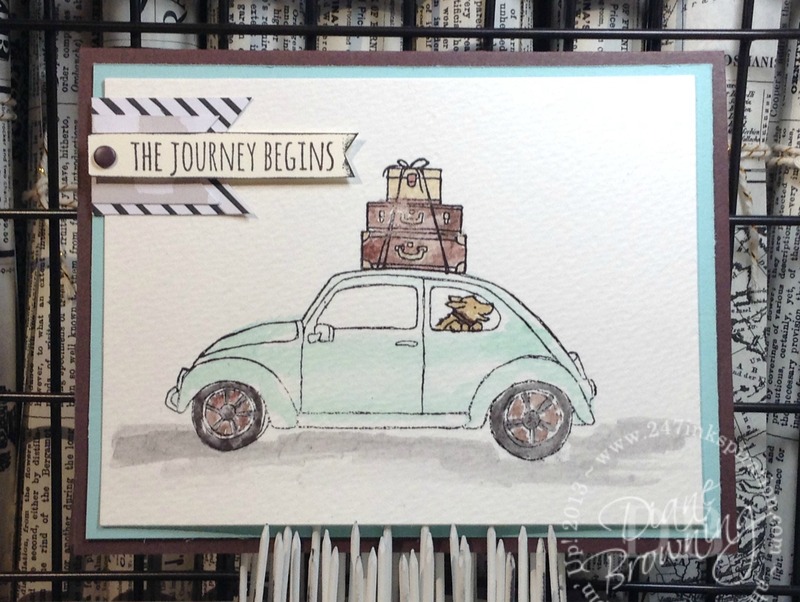 Back in November, I attended a Demonstrator Event hosted by Stampin Up and received “Beautiful Ride” as a giveaway. Isn’t this little VW bug car so cute? Plus the stamp set includes a bunch of adorable accessories to go with the car. I love the dog that’s hanging out the window of the car. You just know this little doggie is so excited to be going on an adventure with you. So, pack your suitcases and let the journey begin! We are going to have an awesome Spring playing with all the new goodies coming out. For this card, I used watercolor paper. Watercolor paper is great for watercoloring, but less great for stamping. If you look closely are the car, you can see the outline image is not even all the way around the car. I hate when that happens, but it’s part of stamping on watercolor paper. You can watercolor on regular card stock, but too much water will warp the paper. Using my Aqua Painter, I colored in the Basic Gray road below the car, Pool Party for the car, Chocolate Chip for the suitcases and Crumb Cake for the doggie. Anytime you watercolor, you want to be sure to use the correct black ink so it does not react with all the water and ink you’ll use to color in your image. I used the Basic Black Archival Ink pad. You’ll want to use the same pad or a Black Staz On ink. The card bases are Pool Party and Chocolate Chip. The patterned flags are from the 6×6 Go Wild Designer Series pad. This pad of paper is mostly neutral colors and has lots of different patterns. The card is topped off with a Chocolate Chip Candy Dot. This would make an awesome card for a guy. And it would be so easy to swap out the sentiment for a “happy birthday” and the suitcases for a birthday cake. Hmmm… now I think I need to go make one like that! Before I forget to mention, today is the very last day to purchase your Holiday Catalog goodies. There are a few things that will be carried forward, but most of the items are going to be retired forever. And some items are already sold out. You make me want to get this set!!!!! Great card. Thanks Poli! I’m working on some more ideas with this sweet ride!